I grew up as a Kiwi kid and nothing else says Christmas and summer parties to me like freshly picked strawberries dipped in chocolate. Here in Queensland we get some of the biggest, juiciest and sweetest strawberries I’ve ever tasted but they all ripen in the depths of winter. By Christmas it’s way to hot and humid for a good fresh berry. Serendipity struck last week when I saw a smoothie recipe mention dehydrated strawberry powder and a few days later I stumbled across a discount coupon in a Gold Coast magazine for organic, Australian grown dehydrated fruit and vegetable powders. I was online at the speed of light and that same week my jar of delightful Super Sprout 100% strawberry powder arrived at my door. After a spoon (or two) to test the flavour and consistency I set about creating my inside out chocolate dipped strawberries and viola … I give you strawberry dipped chocolate truffles. 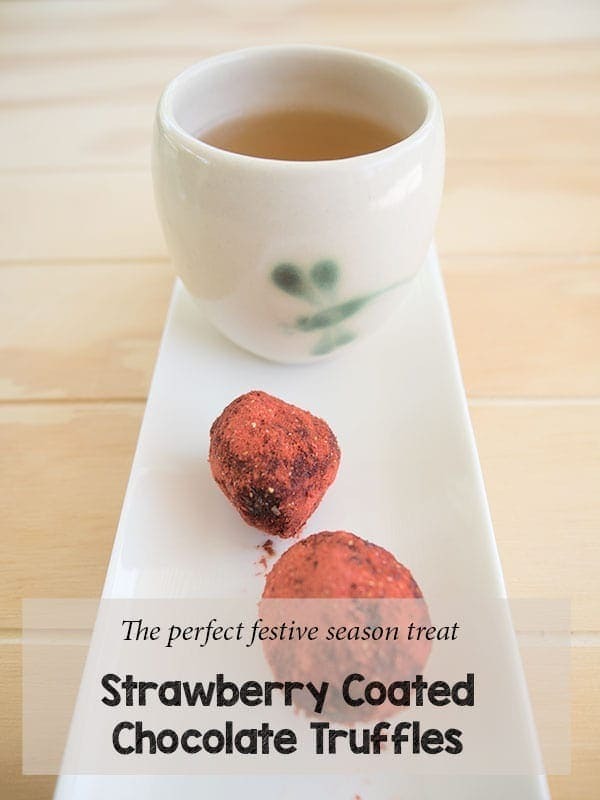 Now of course if you don’t have access to strawberry powder for coating or you prefer an alternative coating you could always roll these in a good cocoa powder, desiccated coconut or some festive coloured sprinkles for the kids. Cut the chocolate into very small pieces and place in a heat proof bowl. The pieces need to be cut small, not just broken into the marked squares or they won’t melt evenly. Heat the butter and cream in a saucepan over a medium heat until it just begins to simmer. Pour the cream mixture over the chocolate and stir until all the chocolate has melted and is smooth. Add the coconut and ground almonds and stir thoroughly. At this stage you’ll be thinking it’s way too runny but allow it to coll and then refridgerate well before attempting to form into into balls. Remove from the fridge, pick up tablespoon sized lumps of the mixture and roll into small balls with damp hands. At this stage you can refrigerate again until you are ready to serve or place them in an airtight container in the freezer. 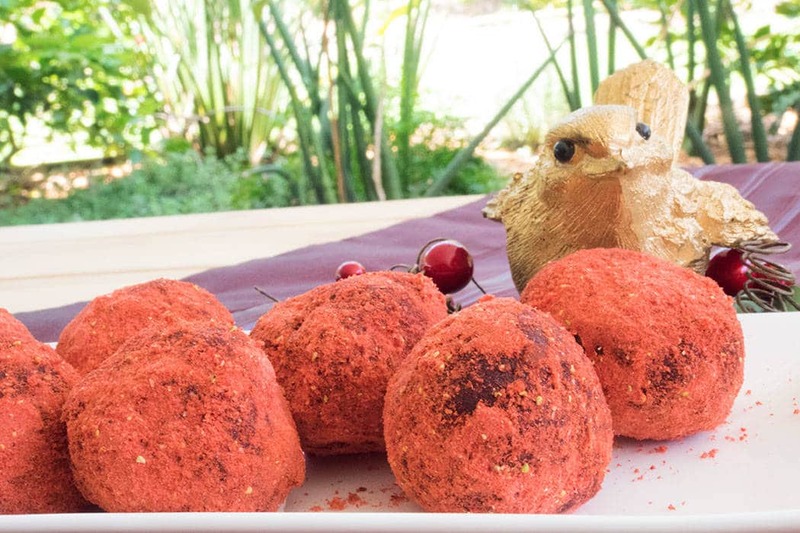 When ready to serve roll the balls in strawberry fruit powder, Dutch cocoa, icing sugar or dessicated coconut. This can be done at little in advance of serving but if you freeze or refrigerate again once dusted they won’t look as good. 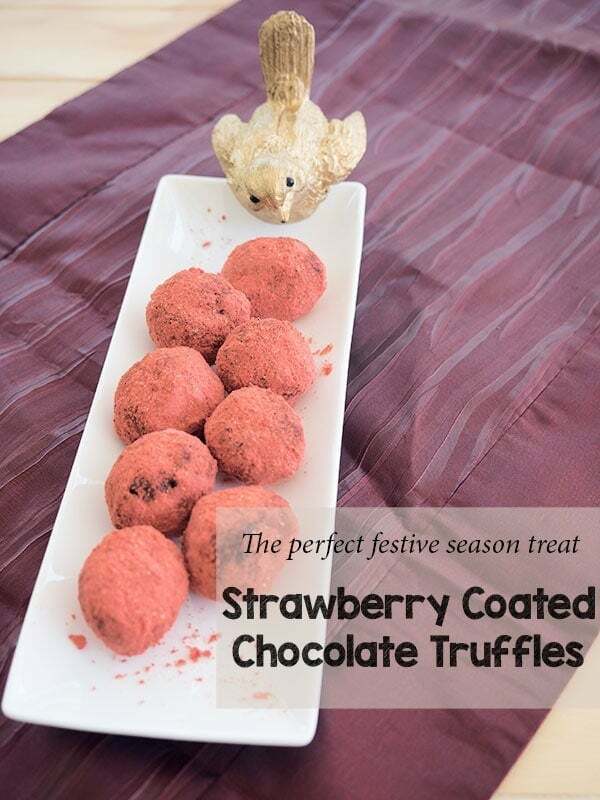 The tangy strawberry adds a nice edge to the rich creamy chocoate making them something a little different. And as someone who shall remain anonymous pointed out, eat enough of them and that strawberry powder counts as one of your fruit serves for the day! These strawberry dipped chocolate truffles are great for all the family but if you prefer your holiday treats with a touch of boozy goodness then you need to check out this divine quick and easy Baileys fudge recipe. YUMM! 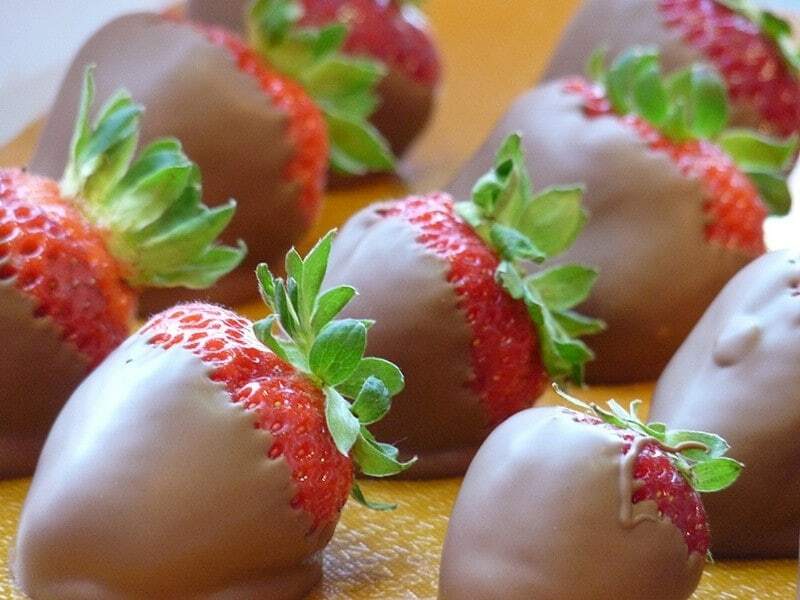 The chocolate strawberries are too delicious. I wish i could eat them now. Whenever I go shopping at David Jones I always buy chocolate coated strawberries. They’re so delicious! But these are even more clever! Thanks Lorraine, I didn’t know DJs had chocolate strawberries — yum!